— An exhibition at Neil Armstrong's alma mater is offering the public a new look at the student and man who became the first moonwalker. 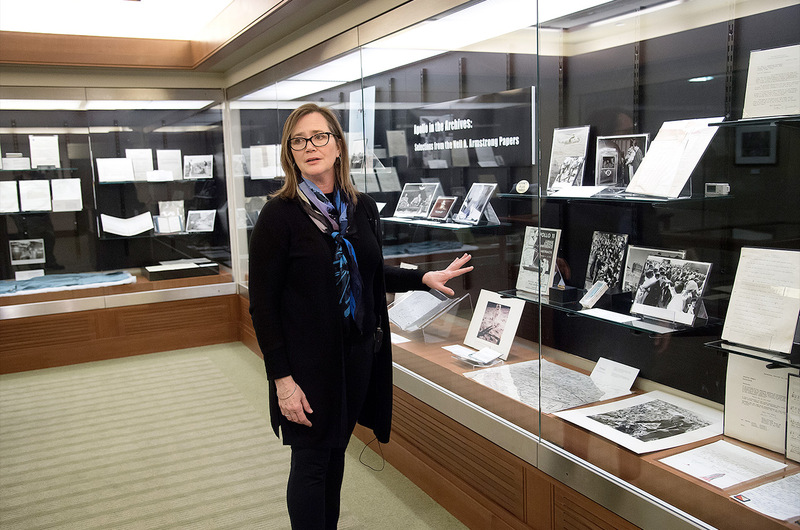 "Apollo in the Archives: Selections from the Neil A. Armstrong Papers" opened on Monday (March 18) at Purdue University in West Lafayette, Indiana. The exhibit, which is timed to coincide with the 50th anniversary of Armstrong's Apollo 11 moon landing in July, showcases select documents and objects from the school's research holdings. 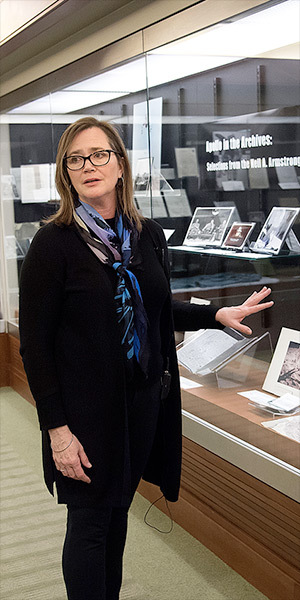 "This exhibition offers the public an opportunity to get to know Armstrong and the steps leading up to the Apollo 11 mission through access to Armstrong's papers," said curator Tracy Grimm, the associate head of Purdue Archives and Special Collections and the Barron Hilton Archivist for Flight and Space Exploration in a statement. 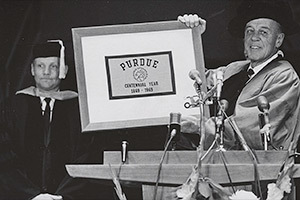 Armstrong selected Purdue to house and curate his personal documents in 2008, with the understanding that the university would use his papers to inspire a new generation of students. Four years later, after Armstrong died at the age of 82, his widow kept with her late husband's desires and greatly expanded the donation. "After Neil passed away in 2012, by far the bulk of the collection came as a result of his widow contacting us," said Sammie Morris, a professor and the head of Purdue Archives and Special Collections. "We only had at that time maybe eight boxes and now we have about 400. And that is because after he passed away, Carol called our dean of libraries and said, 'I'm worried about all this stuff he had in the house and in the garage. Would you send someone out to look at it and take what you want?' And that is an archivist's dream." The collection comprises Armstrong's years as a student at Purdue, including his notebooks, textbooks and reports cards, through his time as a NASA astronaut and beyond. Students and faculty, as well as researchers outside of academia, can request access to the archives to "see what the day to day was like for a human being who was involved in the endeavors of flight and space exploration," said Grimm. "it is really a diverse collection, but it is a research collection," she said. "It is not a lot of objects, but there are some." "Apollo in the Archives" is now providing the public with a glimpse at the collection. Located on the fourth floor of the Humanities, Social Sciences and Education library inside Purdue's Stewart Center, the exhibition focuses on Armstrong's path to the moon, from his training and coursework to the planning that went into how and where he would land on the lunar surface, to the success of the mission itself and its impact on society. Among the items on display are an Apollo 11 flight suit worn by Armstrong, his NASA astronaut program acceptance letter, a bag of personal items flown aboard the Gemini 8 spacecraft and a Lunar Landing Research Vehicle (LLRV) pilot's flight checklist. "There is a model of the lunar lander that a contractor made," said Grimm in a video released by Purdue. "We have some star charts [and] we have maps ... lunar surface maps." "We also have a Purdue Centennial flag that Neil was given to take to the moon. 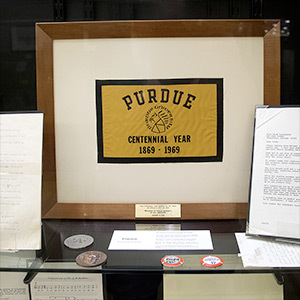 It is a 1969 Purdue Centennial flag that was given back to the university when Neil returned and received an honorary doctorate," said Grimm. 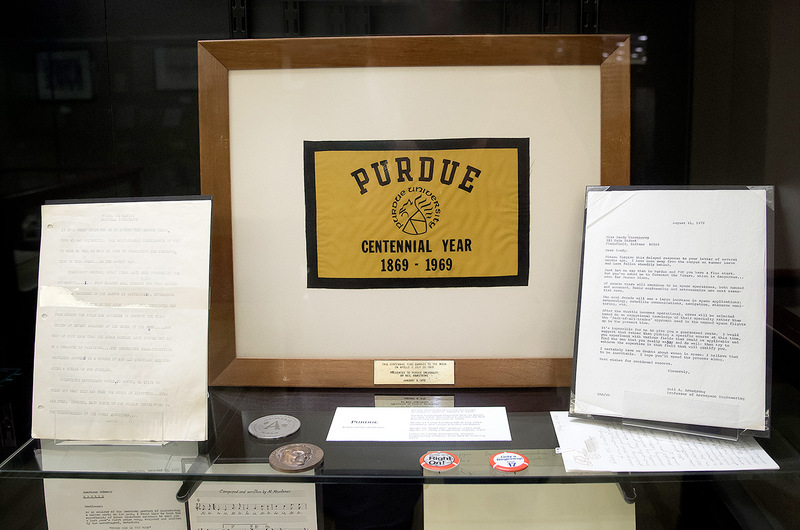 "Now here we are in the 150th year of Purdue, it is the 50th anniversary of Apollo 11 and we have this symbolic item in this flag that is a pretty great part of the collection." In addition to the "Apollo in the Archives," Purdue's Ringel Gallery will host "Return to Entry," an art exhibit featuring pieces inspired by Armstrong's archival collection. Artists Frances Gallardo, Michael Oatman and Jennifer Scheuer were challenged to bring together science, engineering and art to imagine "new horizons" informed by the documents and artifacts from the Armstrong papers and the papers of other astronauts and engineers. "Apollo in the Archives" runs through Aug. 16. "Return to Entry" will run March 25 through May 11. Purdue Archives and Special Collections is open from 10 a.m. to 4:30 p.m. Monday through Friday.